PR & Social Media Back Talk: Does PowerPoint Make You Stupid? I've recently wrote about an article that makes the case that e-mail makes us stupid. I do think that e-mail can, in fact, make you stupid. Next up: PowerPoint. According to a front-page New York Times article, "We Have Met the Enemy and He Is PowerPoint." The point of the article: PowerPoint makes us stupid. 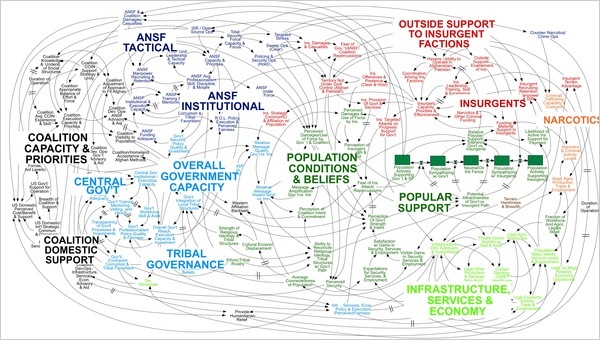 The proof: this slide from a presentation made to American and NATO commanders. Now I've written before about PowerPoint (Death to PowerPoint?). Here's a group of people who could actually make it happen. Actually, I'm wondering if we're going to see more articles claiming a different technology tool makes us stupid. Google? Of course because you used to have to know things. Now you just Google it. Twitter? Of course, because we're limited to one thought. iPhone? Sure, because you used to have to interact or keep yourself occupied while waiting in line. Now you can ignore everyone because you've got to check email or download an app. BlackBerrry? Kind of a combination of Twitter and iPhones. Playing BrickBreaker means never having to interact with other people except through your CrackBerry. Let me know what you think. I'll even accept e-mail responses and PowerPoint attachments.